When I was a very young child in Arizona, our house was robbed in the middle of the night while my parents were fast asleep. The story is that my mother awoke as a man was rifling through her dresser with a flashlight in his hand, and she sat up in bed and screamed. My mother sprang from the bed, hysterical, and somehow managed to scare the intruders away in a fit of panicked rage. When they finally got their bearings, my mother and father found that their phone line had been cut and several of their belongings were lined up on the floor of the living room —the TV, the stereo, and whatever else they had of value— staged by the front door, waiting to be hauled off. In the kitchen, evidence that one of them had helped himself to something from the fridge. I don’t know if my father owned a gun then, or if perhaps that incident was what motivated him to look into purchasing a weapon — it certainly seems like the sort of reaction he would have had, given the fact that when I was in my twenties and living in Albuquerque, he advised me to carry a gun with me when I hiked alone in the foothills of the Sandia Mountains. Though I did not grow up around guns, both of my parents had guns registered in their names, and I can recall in the very blurriest of early memories accompanying my parents to an indoor shooting range. It’s likely that it was just a hobby — just another activity my father unsuccessfully attempted to get my mother to enjoy, like hiking or boating, but in my mind the shooting range and the intruders always seemed to go together. I remember complaining about and tugging at the too-big earmuffs over my ears, and taking them off in a fit of discomfort at precisely the same moment that my father or some other adjacent person fired his weapon at the target silhouette. The succession of shots echoed in my unprotected ears and startled me so badly that I immediately began to cry. I remember touching the flesh behind my ears, thinking I’d just been shot in the head. The first and last time I shot a gun was in college with my then boyfriend and future husband’s rifle — we were camping with friends on the edge of the Erie Canal, on his grandfather’s land in rural upstate New York. We’d cast some fishing lines into the water, put our case of beer into a mesh bag we had tied to the root of a fallen tree and dropped it into the canal to keep them cool. We wandered around the dense second-growth forest of his grandparents’ property, and pulled out all the camping chairs and rotten tables his family kept stored in an old abandoned school bus that had been dumped at the site — things his father and uncles used whenever they came down for hunting or fishing or cutting firewood. I remember whooping with pride when I shot the empty beer can we had staged on a stump, the perfect aluminum void of where the bullet had entered the can, and the jagged, explosive opening of its exit through the other side. I kept that beer can as an artifact for a while, but it ultimately failed to survive a series of successive moves. Now what stays with me is the memory of shooting a gun next to a faded yellow bus. The flag is being flown half-mast again, and yesterday, because of what happened in Parkland, Florida, I received a somber letter from my daughter’s school in the mail. It included information on lockdown drills and a fact sheet on How to Talk to Your Children About Mass Shootings. I read the School Emergency Information Guide for Parents and Guardians, and lingered for a while on the part about Parent Responsibilities During a School Emergency and Reunification After a School Emergency — how we must resist our instinct to call the school or come and rescue our children if an intruder has penetrated the building. We should not rush in, it says. We should stay close to our phones and email, monitor radio and TV reports for updates and instructions. So much restraint. Such ingrained restraint that this is really all we do even after it happens again and again and again. I can recall tornado drills as a kid. We’d line up against the halls of our school, crouched down in child’s pose with our hands clasped behind our necks. We did this because we lived in the Midwest, and tornados were a fact of life, a threat beyond our control. Now, a generation later, my children are doing drills to practice protecting themselves against a mass shooter. They do this because we live in America, and mass shootings are a fact of life, a threat beyond our control. The NRA White House says: “When we declare our schools gun free zones it just puts our students in far more danger.” We need to “harden” schools as a deterrent, arm more teachers with guns. Soft targets? If we looked at the world the way the NRA would like us to look at the world, every place with people and the absence of guns might be renamed a soft target. As in, the kids ride the soft target to their soft target, and after they’re dismissed from their soft target, they walk over to the soft target for a snack and then go to the soft target to get a book for their research project. If we looked at the world the way the NRA would like us to look at the world, our fear would compel us to harden and arm all the places our children go: the school, the downtown deli, the library, the grocery store, the mall. Not that I don’t understand the impulse to protect. What happened to my parents has been knitted into my bones, so I find myself sympathetic to those who wish to use a gun in their home’s defense. And the meat on my husband’s childhood kitchen table was a result of a rifle in my father-in-law’s hand, so I understand the role that guns can have in keeping a family suitably fed. For me, the cognitive dissonance around guns happens with shooting for sport — when one’s demand for military-grade weaponry to shoot for recreation makes it easy for another to access such firearms for less benign pursuits. And I bristle at the refusal of some to acknowledge the role that easy access has in this country’s epidemic of mass shootings and gun violence. Why is my children’s right to a gun-free school environment less important than another’s right to get an erection from the experience of blowing up prairie dogs with a semi-automatic rifle? I considered the offer briefly, but thought better of having my money potentially used toward the purchase of some other semi-automatic weapon. What I want right now is policy change, as in no more civilian access to military-grade automatic and semi-automatic rifles. I gave my money to Everytown for Gun Safety instead. To be fair, this person is a good person, a law-abiding gun owner who is supportive of some gun reform. Registration and background checks, perhaps, but probably not banning anything outright. To folks like him, it’s an economic argument, driven by one’s willingness-to-pay. How much am I willing to pay to compensate him for his property? How much will I pay to destroy this firearm so it will never be sold to some disgruntled person who has more ready access to guns and gun accessories than to affordable mental health care? How much am I willing to pay to prevent this device from getting into the wrong hands and sending bullets through adolescent flesh at more than 3,000 feet per second? But what about ability-to-pay? Should one’s right to live without the oppressive fear of gun violence be dependent on their personal ability to pay for the removal of that threat? Doesn’t that sound a little like… extortion? And what if you’re on a limited income, like a teacher’s salary? Besides, haven’t we already paid enough? My friend who is a teacher tells me that during active shooter drills, she must quickly lock the classroom door and gather all the children down onto the floor and behind the desks into a tight corner of the room, and then she must take attendance and slip it into the hallway under the door to show the principal that she’s accounted for all her kids. Then, while they sit there in silence pretending to be hiding from a mass murderer, someone outside rattles the door to make sure that it’s actually locked and she sits with her students holding her breath, heart pounding, wondering about the kid who is stranded in the bathroom while the door shakes and shakes and shakes. The students say, We are scared. We are the children, you are the adults. Do something to protect our lives. Please keep guns out of our schools. Trump says, I don’t think I’ll be going up against them. I really think the NRA wants to do what’s right. The NRA says, Schools must be the most hardened target in this country and evil must be confronted immediately with all necessary force to protect our kids. The students say, Please keep guns out of our schools. The NRA says, No. And to all the journalists and politicians and celebrities who dare stand up to us: Your time is running out. The clock starts now. Terrorism: noun. the unlawful use of violence and intimidation, especially against civilians, in the pursuit of political aims. What will it take to stop mass shootings? Please. We all know what it will take, but we just can’t seem to summon political will. The half-mast flags aren’t working. Thoughts and prayers aren’t working, either. And what of the letters and phone calls to politicians, the parent testimony, and the press conferences with traumatized teens wiping their tears away as they plead for sensible gun control? The NRA will flex its arsenal and remind us of our soft target status until we fall back into line. I think the aggressive gun culture in America right now echoes the racial terrorism this country endured during the Jim Crow-South — by which I mean obedience from the masses due to the threat of a punitive act. 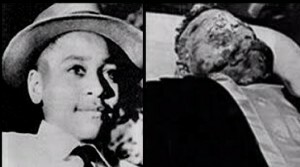 Back then, it took the gesture of a grieving mother —whose 14 year-old son Emmett was pulverized and shot and dumped into a river for allegedly whistling at a white woman in 1955 Mississippi— back then it took her insistence on an open casket to force the nation to confront its own brutality. I try to imagine that courage, the courage it took for a mother to pull the curtain on the violence that was inflicted on her son. Do you have the courage, America? Do you have the courage to witness, truly witness what a semiautomatic rifle does to a classroom of high school kids, to the flesh of an innocent child? Do you have the stomach to truly acknowledge the depth of their exit wounds? Because America, I’m afraid this is what it’s going to take for you to stand up to the NRA. It’s gonna take the face of Emmett Till.